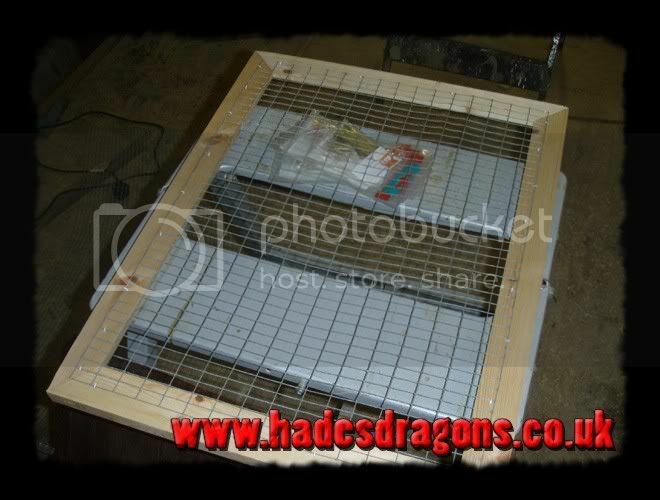 After spending the last couple of days making a new chinchilla cage, I thought I'd post up a "how-to" guide to show how I've always made my large rodent cages. 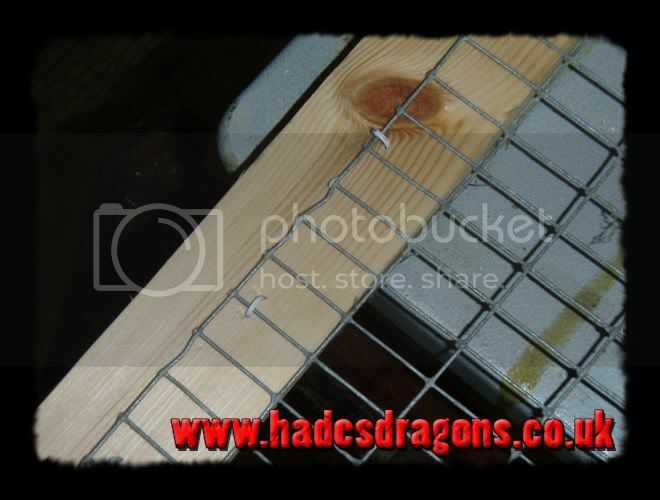 These cages offer more security than the all-mesh cages, as well as a lot more space and - if you build them yourself - usually work out cheaper and can be tailor-made to your needs. If made from decent-quality materials, they can become "living" pieces of furniture as well as just being cages; a large, attractive cage with a couple of active rodents in it can make a fantastic centerpiece for a room. 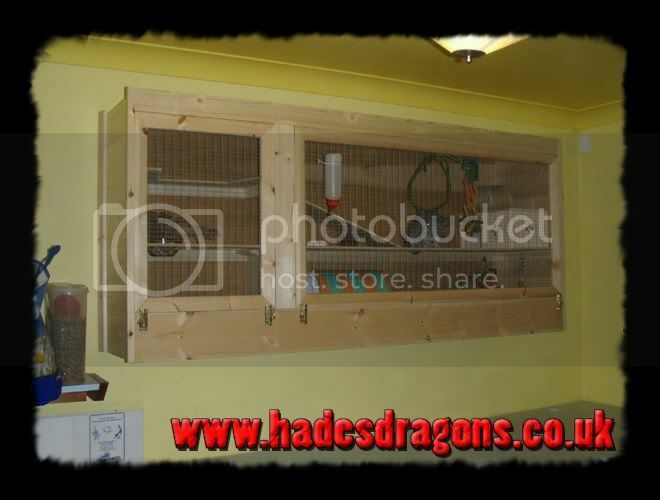 Although this is a chinchilla cage that was designed to be wall-mounted and wider than it is tall, the basic method can be adapted to make cages of all sizes. I've made 6' tall x 3' wide free-standing cages, as well as smaller, more compact cages. 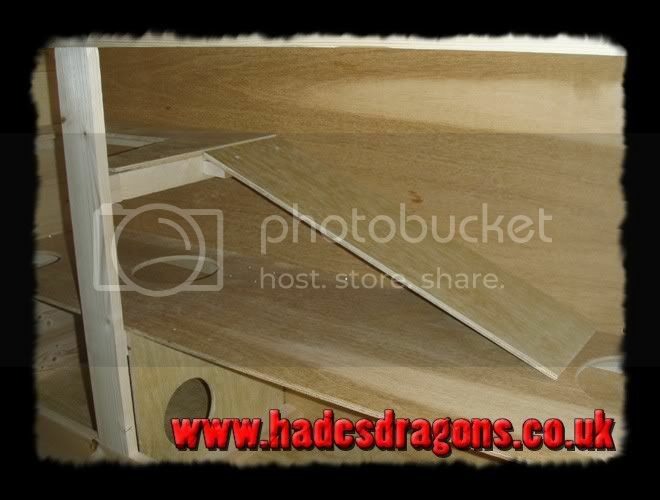 Some of the principles in here can be applied to making decorative reptile cages. 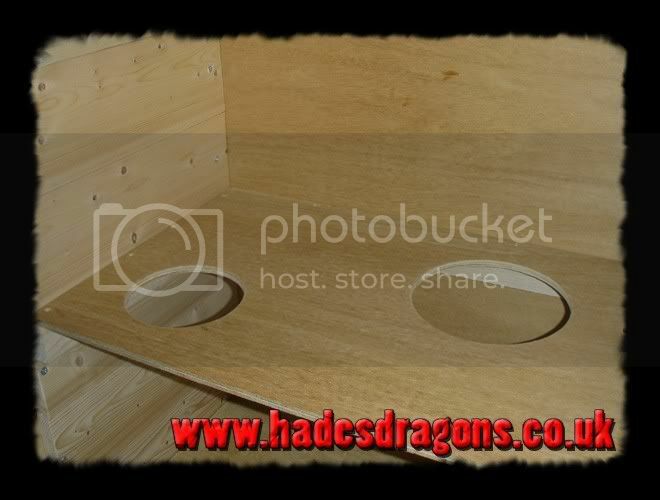 I'm in the process of designing a couple of reptile cages using a similar method; photos will be put up in the relevent sections when the cages are complete. 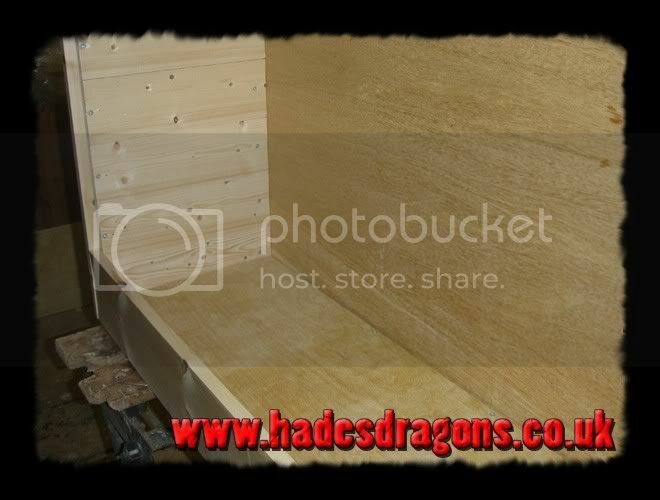 This method requires only fairly basic wood-working skills and few specialist tools. 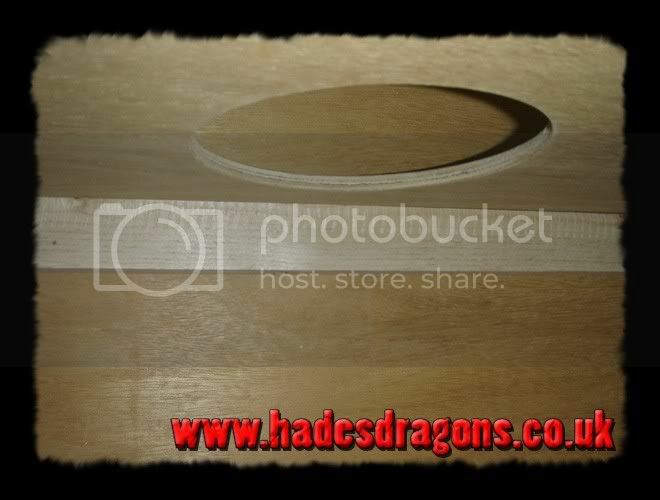 All of the wood used was purchased from B&Q and cut at home; nothing is specially made / ordered etc. The first step it to make the sides. 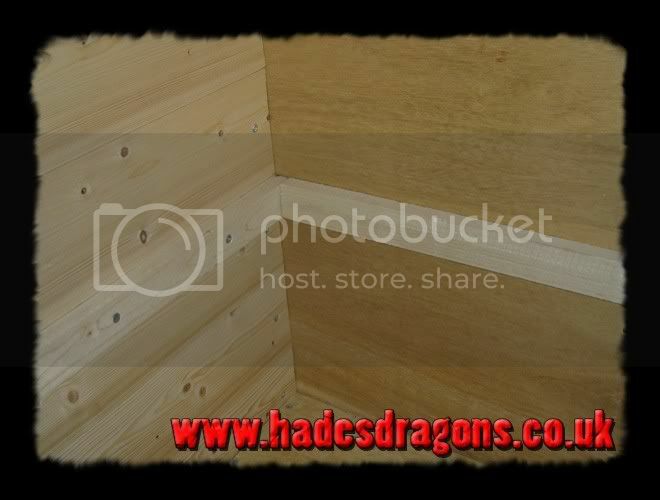 My method uses tongue and groove flooring, with a strip of architrave on either side for the two sides. This means you don't need a "frame" as such for the sides. 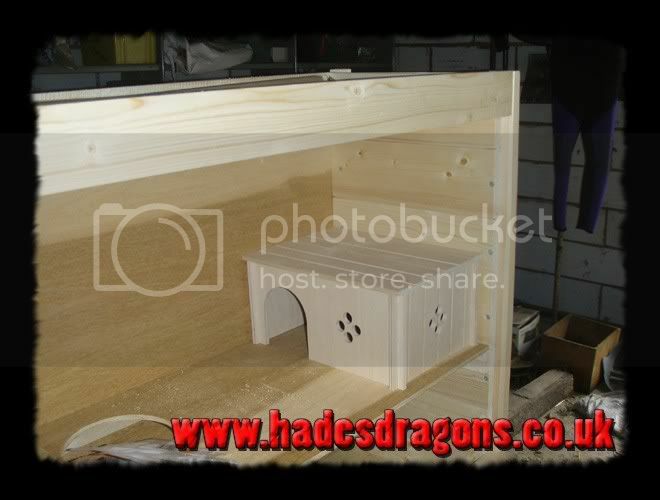 The architrave needs to overhang the front by the thickness of the pieces that will form the front of the cage (in this cage 18mm) and at the back by the thickness of the backing (in this cage 9mm). 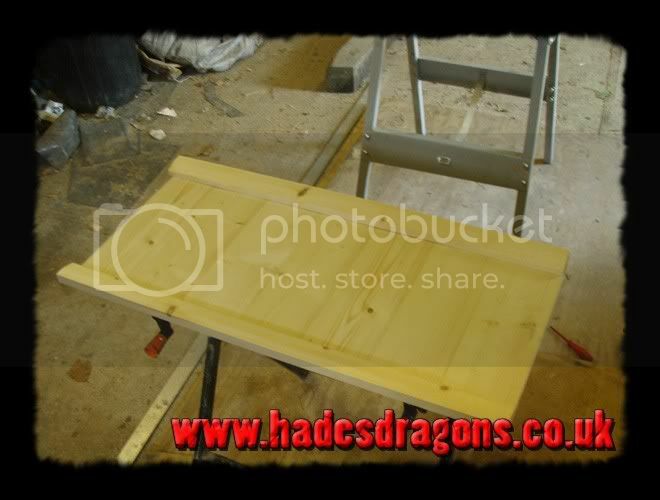 Once the sides are complete, the front and back pieces can be cut to size. 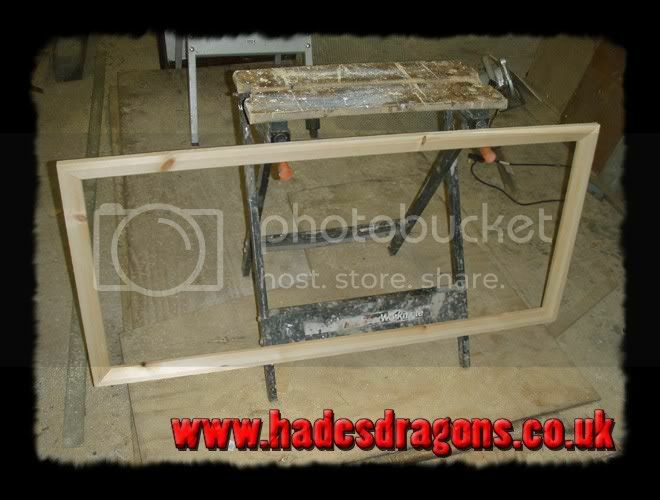 This cage used 9mm plywood for the back, and two PSE lengths to make the frame for the front. If you use a wider piece for the bottom, it will give you the depth needed to fill it with substrate. I prefer to use wood-based cat litter as a substrate for chinchillas. 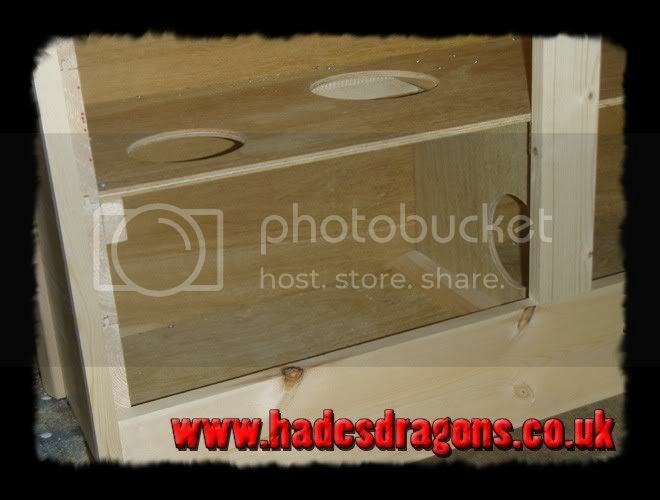 The plywood screws onto the sides from the back (thus hiding the screws). 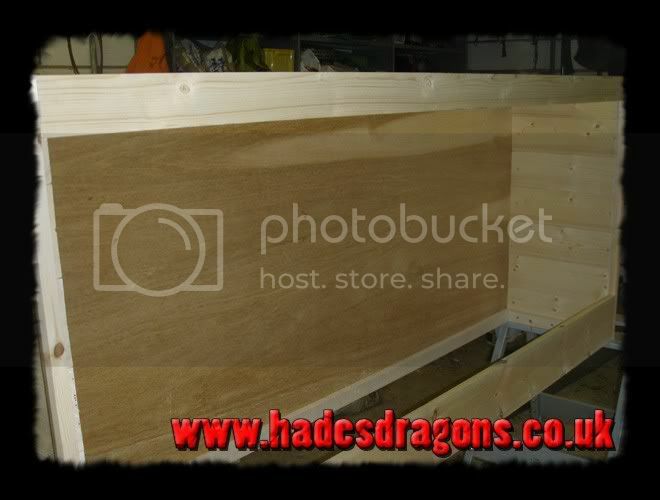 The top and bottom front pieces can be glued or "pocket-screwed" from the inside, again ensuring that no screw heads etc are visible. The top and bottom are attached using baton. 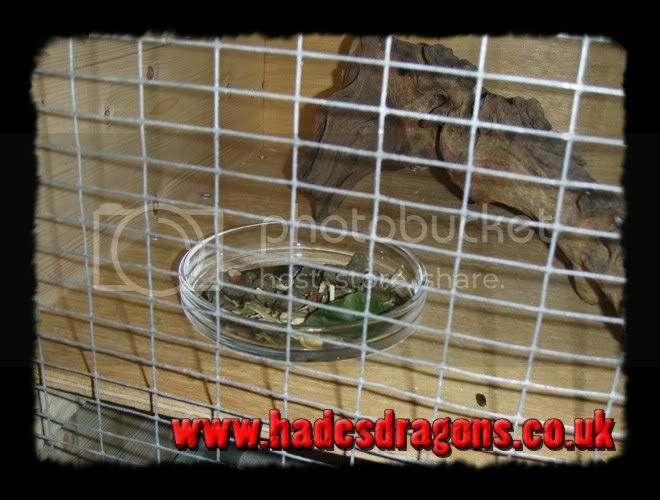 In this cage, due to its position on the wall, neither the top nor the underside of the cage will be visible. I attach the top and bottom from inside the cage; rodents are compulsive gnawers and will gnaw at any exposed baton. By attaching the top and bottom from the inside, there are no exposed edges for them to get their teeth into, and they can't chew at the structure of the cage. If the top / bottom was going to be visible, it would be easy to add a second sheet on the outside of the baton, to give a double-skinned construction - this keeps the outside looking attractive, whilst still preventing the animal from getting access to the baton etc. If this method was being adapted for a reptile cage, you might want to use the two-skinned approach with a layer of polystyrene between the skins to provide insulation and reduce heating bills. The next step is to add shelves. 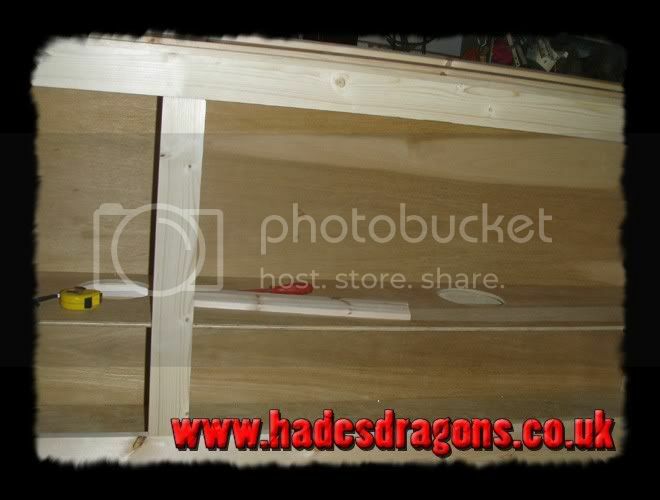 In this cage, they won't be covered with substrate, won't be bearing a great deal of weight, and are made from the same 9mm plywood as the back. 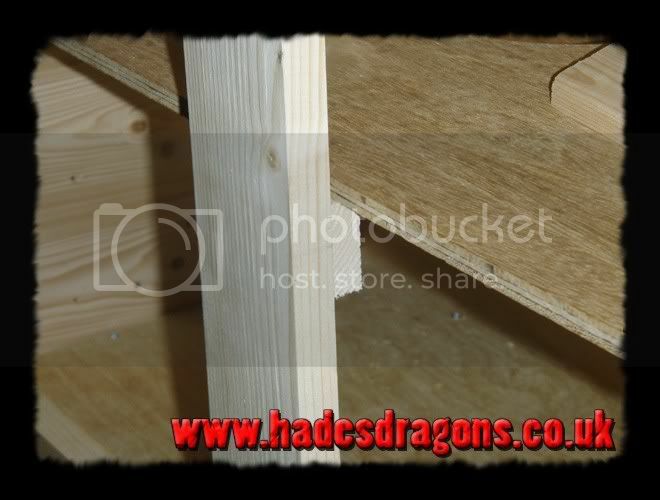 If the shelves need to bear more weight, consider making them from a solid length of wood, and fixing them directly to the back / sides of the cage, without using baton. This baton may end up getting gnawed at, depending on how high you put the shelves, but it doesn't bear the same load as the top / bottom baton, so it's less of a concern. 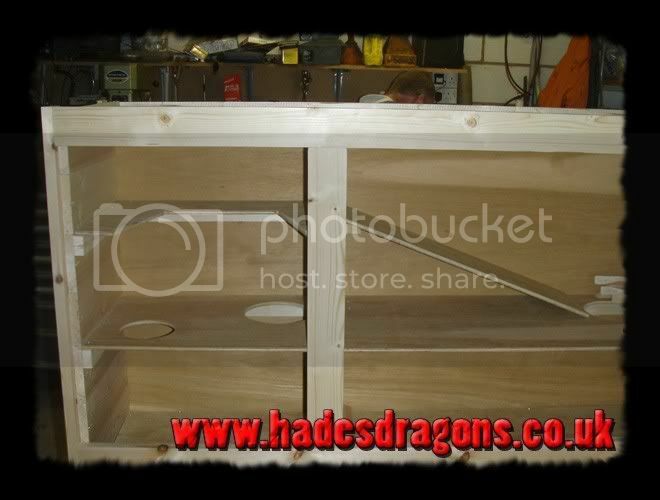 This cage will have two doors - one will be small and used to let the chinchilla out and to feed her; the other will take up the rest of the front, and will only be removed to clean out the cage. In a cage of this length, it's a good idea to have a supporting pillar somewhere along the length to stop the top from sagging. The pillar is used to divide it into two doors. In taller cages that aren't so wide, a single door is fine. Next is to add a "room" in the bottom of the cage. Many rodents that would appreciate such a cage live in rocky environments that have lots of passages / holes / caves etc. Partitioning the cage breaks up the space and gives the occupant more room to explore. After the "wall" is cut to size, a 6" hole is drilled in it. It's fixed in place by strips of baton, top and bottom. The baton on the bottom will be covered by substrate; the baton on the top is out of reach for gnawing. Chinchillas enjoy being high up. As well as putting their cages off the ground, they appreciate shelves / ledges where they can get right to the top of the cage and look down on the room. Such places give them security, and are often one of the most well-used areas of a cage, especially if the room is a busy one with lots to watch. As chinchillas come from a rocky environment with lots of narrow perches / ledges, I decided to make a 4" deep V-shaped shelf for her to sit on. 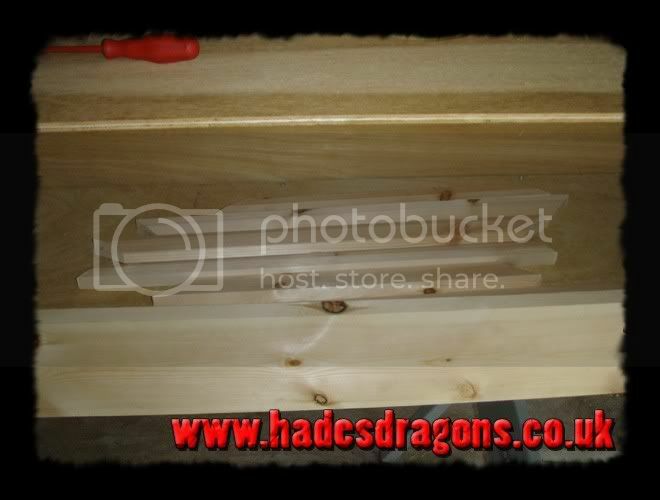 I cut the shelf to size, cut out the middle section, then affixed baton for the shelf to sit on. Again, the baton is just about out of reach for gnawing. Most chinchillas are able to easily jump up such heights. Ours was rescued almost 15 years ago and, although she isn't yet struggling to get around, she may do once she gets even older. Because of this, I decided to add a ramp up to the perch. The ramp is made from plywood. Less agile rodents such as degus / rats would probably be grateful for ramps connecting the areas of the cage together. Many rodents get bored if not stimulated. One way to stimulate animals to to make them "work" for food etc. 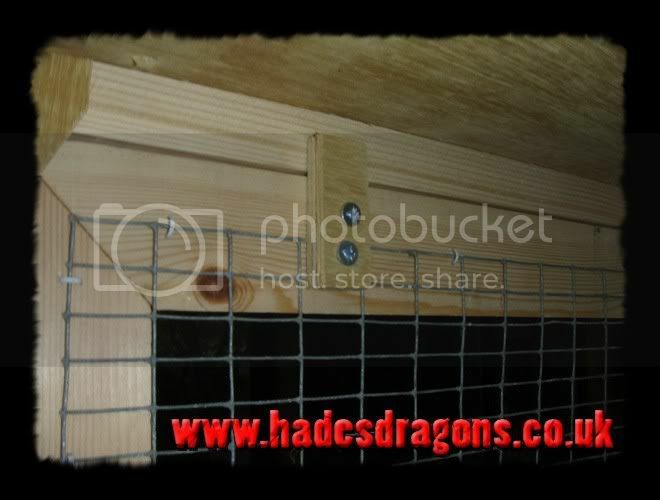 Hooks around the cage allow you to hang food / gnawing items etc, to make it a little harder to get them. 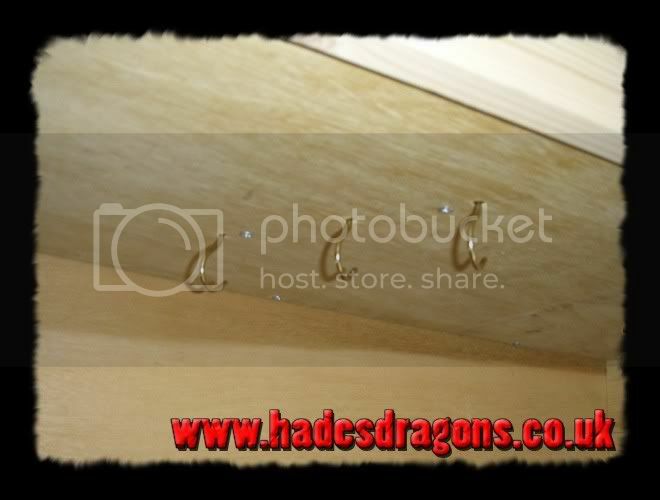 This cage has five hooks - three above the main full-length shelf, and one either end of the large bottom section. 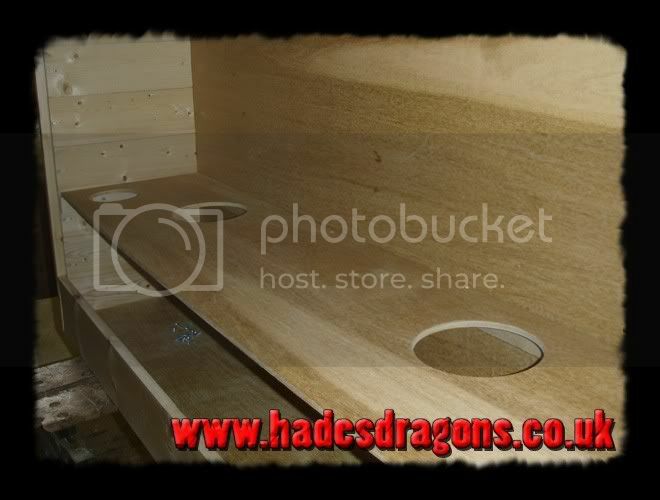 The top hooks are attached to the plywood top by fixing baton to the outside of the plywood top, then drilling through and screwing the hooks into the baton and not the plywood. If the top was going to be seen, you should do this prior to attaching to outer skin. Rodents appreciate a hide-box of some sort. 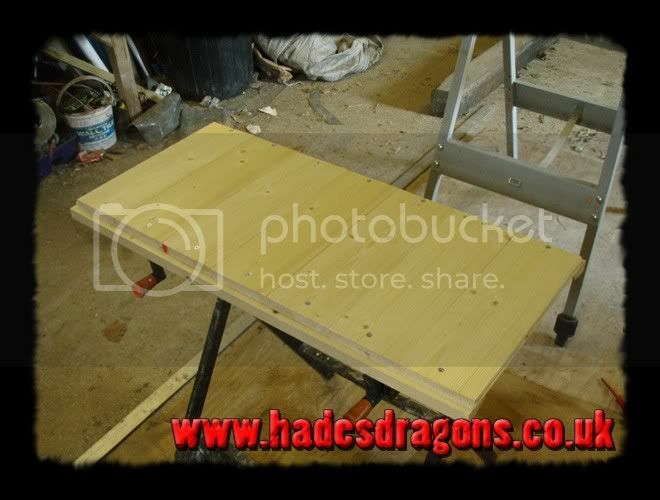 This is one that was bought due to a lack of suitable wood to make one in B&Q. It's not hard to make one yourself though if you so wish. 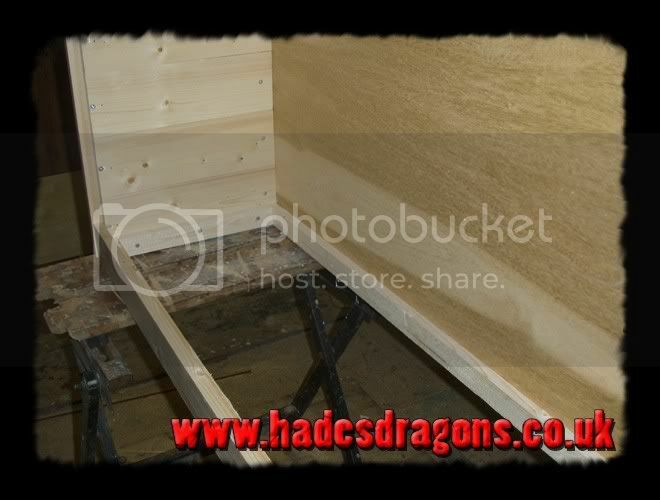 Doors are glued with wood glue, with a nail in each joint to hold them together whilst the glue sets. It's vital you check that the joints are at 90 degrees, otherwise the doors may not fit when dry. 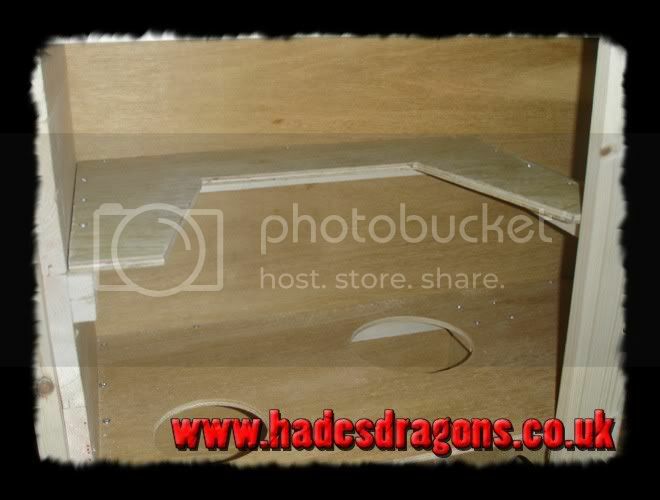 As these doors will be removable, you need to put stops for them inside the cage - these can be tucked up in the corners, and will stop the doors from falling into the cage. 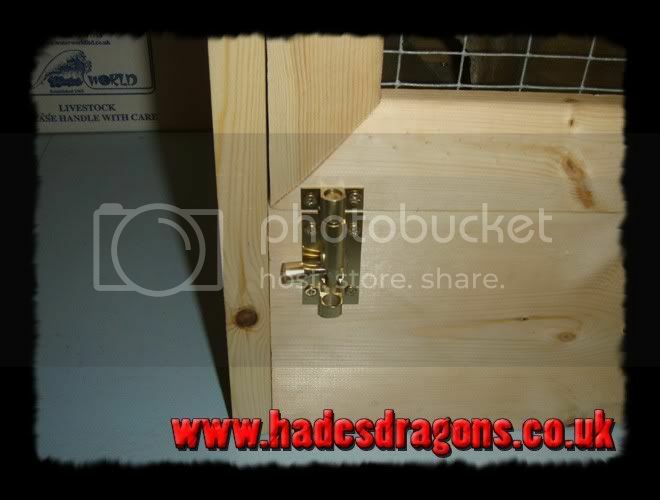 I use two short strips of wood attached to the top of the doors to allow them to "hook" into the cage. This stops them falling forwards. By using tall / high cages, you allow the animal to get up above head height. In the case of animals such as chinchillas, this is desirable to provide security and somewhere "safe" that they can observe from. 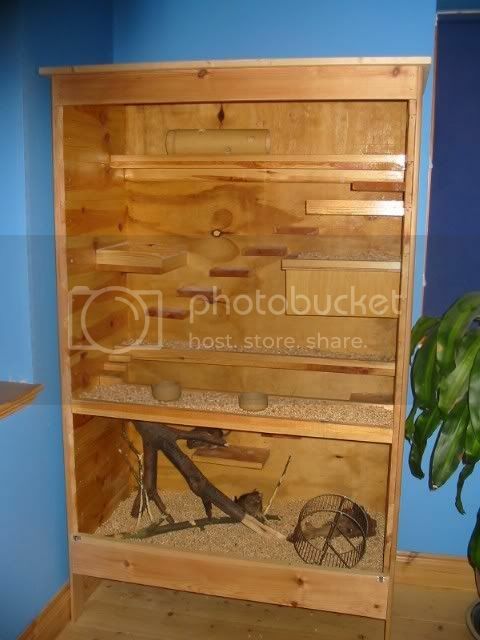 This is another cage I made several years ago to house a pair of degus. It's 6' tall, 3' wide and 2' deep. It used the same basic construction method, but with things on a smaller scale due to the size of the occupants. When the degus died I sold it to a friend with a pair of chinchillas that spend their holidays with us. Hopefully that will be of use to people, and will inspire them to re-think how they are housing some of their animals. Rodents are so much more rewarding when kept in suitable, well-thought-out cages, rather than the all-mesh cages that are invariably far too small for them, don't offer security, and are too basic to keep them adequately stimulated. Chinchillas, rats and degus in particular become much more settled and show more personality when kept in suitable cages where they feel safe, happy and stimulated.